That sounds very sophisticated, but the need vs. love matrix is quite simple. It's just a way to consider the importance of potential expenditures and decide where something should be on your priority list. Once you've mastered the matrix for cash flow, you can use it for time management, too. 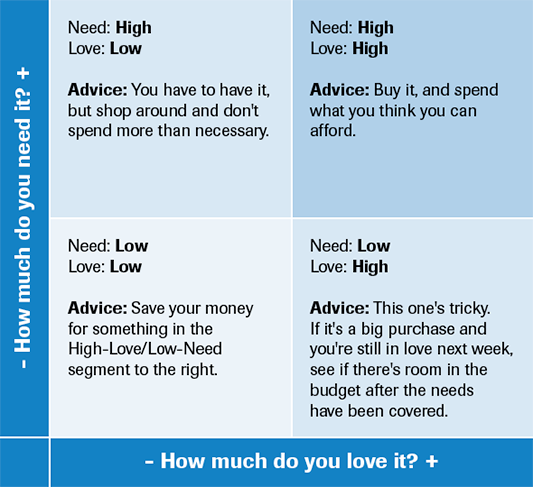 In the upper right corner, if you both love and need something (really love and really need), it's a no brainer if you can afford it. Moving clockwise, the lower right is less clear cut. You may love a skinny latte on the way to work, but you probably don't need it with a capital N. However, it's a pretty small expense, so you may be able to work it into the budget, at least some of the time. If you neither love it nor need it (as in the bottom left), you may want to think about why you're even considering buying it. Are you just craving something new? Feeling bored? Momentarily distracted? Step away from the register. 1THE CARD IS NOT INSURANCE; IT IS A CASH DISCOUNT PROGRAM AND CANNOT BE COMBINED WITH ANY FORM OF HEALTH INSURANCE. Those insured by any government healthcare program, such as Medicare or Medicaid, are NOT eligible for this offer. Insurers may offer a lower cost option. 30- or 90-day Accu-Chek Guide test strip prescription required. Limit 12 vials per refill. Refills cannot be dispensed before 75% of previous days' supply have elapsed. Program may be changed or discontinued at any time.